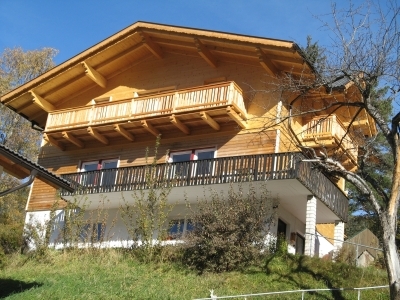 The Cësa (house) „Sotriffer“ is located on the sunny side of Val Gardena just above the centre of Ortisei. From here you have a perfect view on the mountains like the Langkofel and the Sella group as well as the main part of the village. The Cësa is surrounded by a huge garden providing relaxation and peacefulness. A promenade starts directly from the premises inviting for walks and trekking tours. The centre of the village as well as the cable car stations of Seceda (possible access for the Sella ronda) and Alpe di Suisi are all within 5 min walking distance. During the winter season a bus stops right beneath the house. Free parking is available on the premises. The Cësa contains 4 apartments. Apartment “Jakob” is on the first floor is just refurbished. Both the apartment „Franz“ on the first floor and the apartment „Oscar“ on the second floor each have 2 bedrooms (75 square meters in total), fully equipped kitchens and windowed bathrooms with separate toilets. Huge balconies invite for sun bathing. The apartment “Sella” is located in the front house.